We started the day on the shores of the Black Sea, waves lapping on the rocky beach and looking across towards Turkey. This is not surfing country by any stretch of the imagination. Even though it was a bit out of our way, I was dead-set on seeing the new Sarpi Border Checkpoint building on the Georgian side of the border. Designed by Berlin architect Juergen Mayer a few years ago, the intention was to show just how quickly the country is surging into the 21st century. A Georgian meal is nothing without bread, so we thought it was only polite to start sampling early. 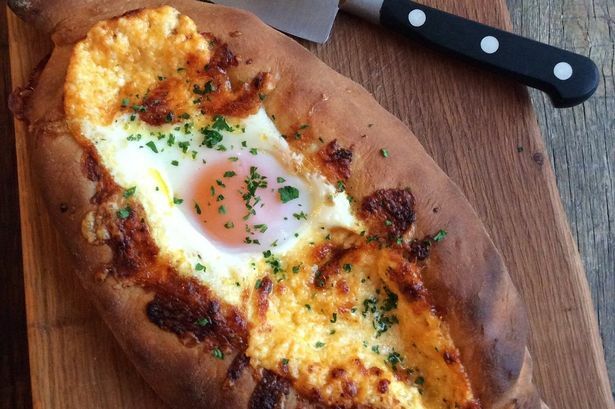 The cafeteria inside the checkpoint building provided us with our all-important coffee, plus Acharuli khachapuri – bread shaped like a flat boat and filled with melted cheese, a raw egg and lots of butter. They hand it to you scaldingly hot and then you quickly whisk the cheese, egg and butter with a fork before ripping off the edges and dipping them into the cheesy mixture. Delicious, but one was plenty. As a former Soviet republic, we were surprised to arrive in the capital Tbilisi and see how diverse the architecture was: medieval cobblestone streets, Eastern Orthodox churches, ornate Art Nouveau buildings and Soviet Constructivist structures from the 1920s and 30s. Visiting the 4th century Persian citadel high on the hill and the hot sulphur baths in the Abanotubani (where Alexander Dumas and Pushkin both visited), we quickly realised how centuries of different cultural influences have left their mark. Even Leroy is flagging after a day of walking on cobblestones and avoiding cable car queues, so we might find somewhere for a quick mtsvadi, a kind of kebab served with sour plum sauce, before tracking down a source of the famous Qvevri wine, the production process so unique it’s now listed as a UNESCO World Heritage tradition. Anyone want to join us?